Snails can be delightful additions to your tank. But sometimes, unwanted snails or an increase in the snail population can wreak havoc on the tank system particularly the plants. There are chemicals which can control the snail population. However, they destroy the good nitrifying bacteria as well, damaging the biological filtration. Hence, these should be used only as a last resort. 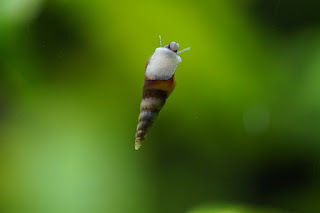 Snails reproduce very fast and hence their population needs to be monitored and kept in check. When the snail population explodes, they may have to be removed. One easy way is to boil a lettuce leaf and immerse it in the substrate and leave it overnight. The next morning, you will find that the snails have climbed on to the leaf to eat it. Remove the lettuce leaf and the sails and throw it away. Repeat this for many days till the problem is under control. Another method is the introduction of fish which eat snails. Several Loach species eat snails. These will help you keep the population in check. There are chemicals which can control the snail population. However, they destroy the good nitrifying bacteria as well, damaging the biological filtration.